I'm offering you here a list of top routes at different UIIA grades. They were nominated to the Miss Tatras by dozens of top Polish climbers. Two authors of climbing guidebooks covering the Tatra region have also contributed their candidates. Thanks to superb granite, the beauty and class of these routes is guaranteed to last eternally, like that well known of Polish women. Come and see for yourself our top lasses and well-preserved grannies. All names are given in Polish. Hrubego ridge offers excellent exposure and surroundings of Newrycka and Hilinska valleys. Prawy Hajdukiewicz on Dlugim Giewoncie; diagonal route on east wall of Mieguszowicki Szczyt with superb rock quality; Zabiego Konia ridge. Lewy Puskas on S wall of Kiezmarski Szczyt**; E pillar of Dzika Turnia. 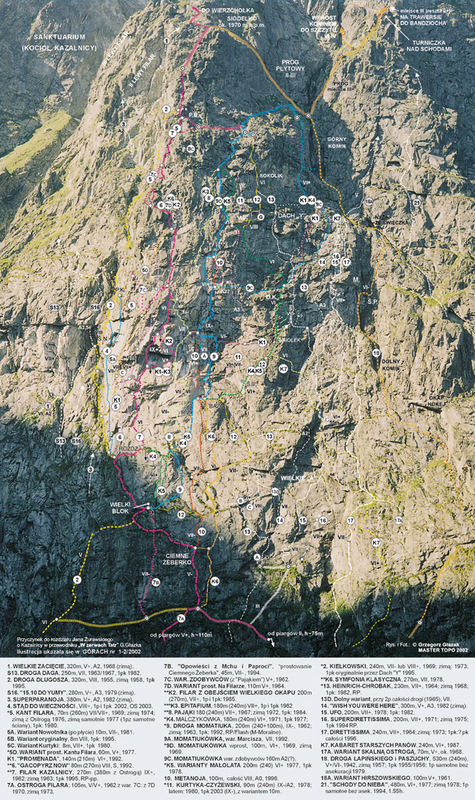 Stanislawski route on N face of Maly Kiezmarski; Pawlowski route on S wall of Maly Lodowy; Korosadowicz route on E wall of Posrednia Gran (Prostredny Hrot); Motyka route and Prawi Wrzesniacy route on S-E Zamarla Turnia; Surdela route on E wall of Mieguszowicki Szczyt is a truly alpine adventure; Motyka-Sawicki route on S wall of Maly Lodowy; Birkenmajer route on S wall of Lomnica; Lapinski-Paszczuch route on Zerwa; Prawy Dziedzielewicz route on Koscielec; Sadek route on E wall of Kolowy. Orlowski route on Ganek proclaimed THE MISS OF TATRAS; Puskas route on Wolowa Turnia exposed slabs on super sharp holds, good friction and compact rock; Sprezyna route on W wall of Koscielec; Obrovski Kut route on S wall of Kiezmarski**; Gwiezdne Loty route and Filarek Malczyka route on Raptawicka Turnia; Hokejka route on S of Lomnica** with good protection, superb scenery and exposure, perfect rock quality and formations; Kowalewski-Palucha route on Mlynarczyk. Kurtyka route on Maly Mlynarz* highly exposed above Biala Vody Valley; Wielkie Zaciecie route on Kiezmarski*. Estok-Janiga route on Wolowa Turnia zigzags between roofs in impressive exposure; Sprezyna route on Mnich combined with Stanislawski route**; Prawy Henrish route on Zamarla Turnia; Direttisima on N wall of Kiezmarski Maly; Komin Lapinskiego route on Ganek. Symfonia Klasyczna** route on Zerwa one of longer routes with very sustained difficulties; Zaciecie route on S wall of Posrednia Gran (Prostredny Hrot) reminds Yosemite climbing; Central Pillar on Ganek uniquely good rock quality, good pro; Pillar on Zerwa; Czarne and Szare Zaciecie route on czolowka MSW. In general, if you are stuck for choice, then go for routes opened by Stanislaw Motyka on Lodowy Maly, Ostry Szczyt and Maly Kolowy. Morskie Oko hut, Terycho hut and Pri Zelnom Pleso hut they all have extensive but slightly messy information on climbing routes in their regions.